In a large skillet over medium high heat add sausage and a little bit of olive oil. Crumble and brown sausage. Scoot sausage to the side of the skillet and add chopped onions and garlic. Season with salt and pepper. Then add oregano, thyme, red pepper flakes and basil. Stir to combine, about 1 minute. Pour white wine and let it bubble and reduce, about 2 minutes. Then add crushed tomatoes and sugar. Stir well then bring the sauce to a simmer. Preheat the oven to 375 degrees F. Position the rack in the center. Grease a 9½” x 9½”-inch glass baking dish (or you can use a 9″ x 13″-inch glass baking dish) with butter. Pour cooked rigatoni into the sauce and toss to combine. Pour half of the pasta into the greased baking dish. Top with half of the sliced mozzarella cheese. Then pour the remaining pasta over the cheese. Then top with the remaining half of the sliced mozzarella cheese. Sprinkle shredded mozzarella cheese and grated parmesan cheese on top, then dot the entire dish with butter pieces. Bake the rigatoni uncovered for 20 minutes and broil it on high for 1-4 minutes to brown the top. Sprinkle some chopped parsley on top and let the pasta stand for 10 minutes before serving. Yummy! Great pics. Can’t wait to see you. 🙂 Have a great long weekend too! Oh my! Perfect comfort food. Plus a glass of wine (or 2). wow I have my fork READY! This baked pasta looks super duper delicious, Anne. This looks fantastic! I think this would be a much better way to bake pasta than lasagne! Looks so saucy and wonderful! Yum! You can’t beat a good pasta bake. Especially with lots of cheese like this one. I reckon some fennel seeds would be great in there too. I love pasta, especially in a red sauce with meat. Ordinarily you’d probably think the chicken wouldn’t give it a lot of flavor, but this dish is very flavorful. The best part was the pasta…cook it just before al dente and then finish it off in the oven. Perfecto! Looks so yummy, I would love to have this too! Have a great weekend! Looks great Anne. Now I’m hungry so will go see what’s in the fridge. I am always in the mood for pasta. This looks delicious & comforting. Oh, how deliciously herb-y and cheesey this looks! Wonderful comfort food. I always, always make extra pasta because I think I like leftovers more than the original dish. This is stunning, the flavors are so perfect for me Anne! Have a good weekend! Holy moly, this pasta dish looks fantastic Anne! I’m so drooling over that shot with the oozing cheese…wish I was the one holding the fork – yum! Have a great long weekend! This looks super delicious, and how beautiful your pictures are! Gosh, this looks delicious! 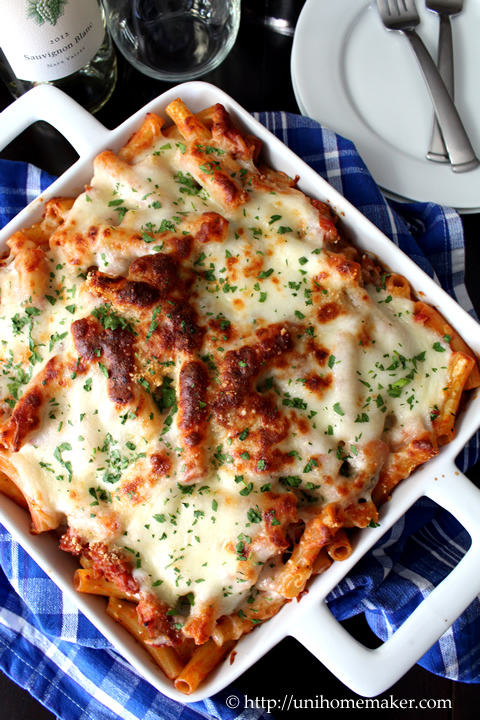 And reminds me how much I adore all baked pasta but rarely ever actually make it apart from lasagna….so going to now, though with a substitute for the chicken sausage as I wouldn’t be able to get that around here!. Gorgeous photos too. I hope you have a great long weekend, too!! My hubby and I love dishes like this! Wonderful photos, as always. I’ve already Pinned this baby !! I love sweet Italian chicken sausages! I think it’s very flavorful and so much lighter as a bonus. There’s nothing I don’t like about this pasta dish! I would love to drop into your kitchen just to see and smell all the yummy food! Have a great holiday weekend! Pasta makes the best leftovers. Great dish. Love how you use, ‘scoot sausage to the side. I’ve never heard of that expression before. Anyway, I’ve just polished off 3 trad made sausages for sups, for the first time in months. Really nicely spicy Cumberland sausages that I slow cooked. Turned out to be a real treat. And I bet every mouthful of this baked rigatoni was as well! Perfect comfort food. That’s comfort food at it’s best! Love the photos, makes me hungry! Great weekend to all! I love pasta and this is a brilliant idea. The chicken sausage together with mozzarella, so tasty. Your Rigatoni with CHicken Sausage looks so comforting and decadent. Whenever I want comfort food, pasta always comes in mind first. As you said it can feed a crowd and stand well as left over….and they are so easy to prepare too. Can’t wait to give this a try. I always look for new pasta recipe to try out. Have a great weekend and thanks for sharing. I tried your pasta dish last night – left out the sausage but added lots of chopped olives in its place… we all loved it, thanks for the idea! 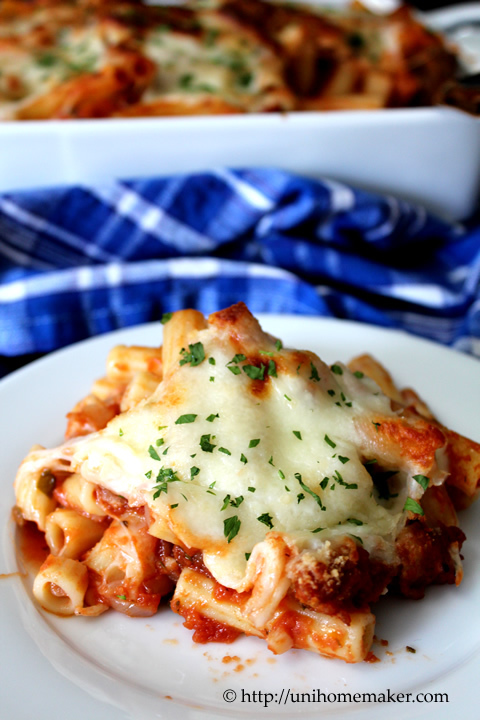 What a gorgeous pasta dish…the cheesy topping looks incredible! This would surely please my family! What I’d give to have this pan for dinner… all by myself! This looks absolutely delicious, Anne. I don’t cook a lot with chicken but I really like this idea. This meal is such a crowd-pleaser! I know my family would love it! I agree, pasta goes a long way in our household, including school lunches. My girls just love pasta al forno and yours, with the addition of chicken sausage, looks superb! Mega yum! Comfort food at it’s best! Yum, I love love love chicken sausage…. 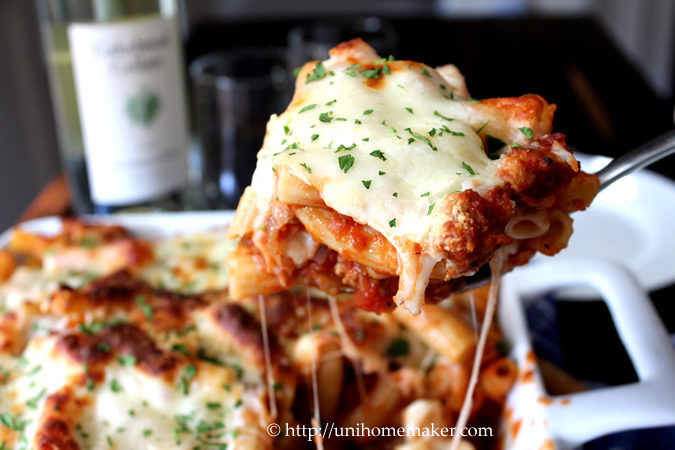 and I don’t think I could ever turn down a cheesy pasta dish! This with some wine … what a nice way to relax after a long week! Anne, this looks so delicious! 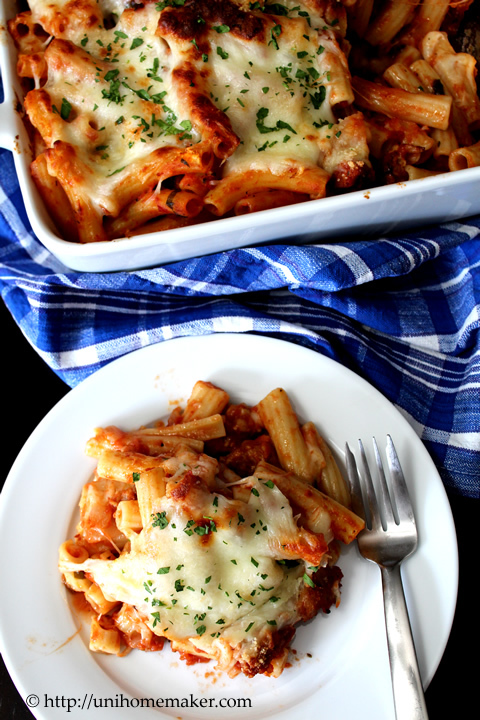 Rigatoni has always been one of my favorite pastas, and it’s the best baked like this with lots of cheese. The sausage is my meat choice as well! Me too! I’ve been eating pasta and noodles lately… I guess I’ve been too busy to think about multiple dishes dinners. 😀 This will be a nice weeknight dinner for us! This looks great! I can’t wait to try out the recipe. This looks incredible. Great presentation and spectacular photos as well. Thanks for sharing!